The last 20 years have seen unprecedented changes in the way we live and learn. Twenty years ago, laptops were considered a luxury and smartphones had not yet hit the market. Today almost everyone has several combinations of laptops and mobile devices, and it is almost a requirement to participate in society. Daily, we see new intersections of technology and life through social media, virtual reality, and artificial intelligence. While technology seems to be directing so much of our lives, we also need to direct a similar focus on developing our emotional intelligence. Lack coachability (26%): The ability to accept and implement feedback from bosses, colleagues, customers, and others. Lack of emotional intelligence (23%): The ability to understand and manage one’s own emotions, and accurately assess others emotions. Interestingly, Only 11% fail because they lack the necessary technical skills. Why do we need to improve our emotional intelligence? We are more educated, more diverse, and more technologically savvy than any other period in human history. All this change has created disruption, which has highlighted the need for greater self-awareness to navigate these fast moving times. The new paradigm requires not only technical knowledge but more importantly soft skills. No amount of technical education can help solve issues arising from ageism, miscommunication, mismanagement, and cultural incompetence. What is needed then are greater learning opportunities to increase our emotional intelligence. So how can we improve upon our emotional intelligence? One of the ways we can become better equipped in the digital age is to slow down and take inventory of ourselves, our strengths and weaknesses and be willing to do the development work that is often required. Some people believe that you are born with emotional intelligence and that it is an all or nothing proposition. However, the brave ones are willing to open themselves to learning about how they show up in the world, through personality assessments, 360 feedback, and coaching. They seek out classes and workshops that focus on improving or building their soft skills. According to Dan Schawbel, New York Times best-selling author, successful people are lifelong learners who push themselves out of their comfort zones. While most people think that when they graduate college, they are finished being a student, successful people remain students for life. 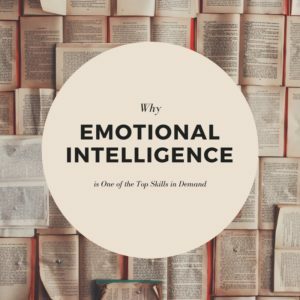 Many of the skills that are required to be successful today are dependent on emotional intelligence. For any current or aspiring leader, if you do not take the time to figure out for your blind spots in this fast-paced day and age, you will be blindsided. Research carried out by the Carnegie Institute of Technology shows that 85 percent of your financial success is due to skills in “human engineering”—your personality and ability to communicate, negotiate, and lead. Shockingly, only 15 percent is due to technical knowledge. We can all improve our emotional intelligence. To inherit the earth in this digital age, it will take time and a willingness to be open and to embrace continuous self-development. Conrad Fernandes is the Organization Development Manager for San Mateo County, where his focus is on improving the culture of engagement and talent development. He is committed to fostering collaborations with other local agencies in the Bay Area to develop the next generation of leaders and serves on the Next Gen Committee. Conrad has over two decades of work experience in a variety of industries including technology, education, local government, healthcare and human resources and uses his life experience to mentor and coach employees.